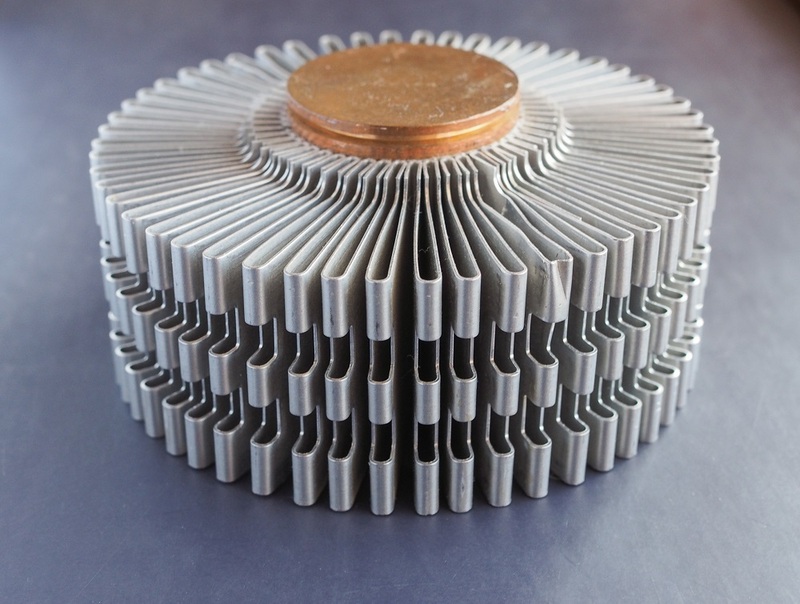 There are many different types of heat sinks used as thermal management solutions, but two of these heat sink designs are unusual and worth exploring in depth, bonded fin heat sinks and folded fin heat sinks. Folded fin heat sinks are created by bending a piece of aluminum sheeting in a fan or fin-like structure. This creates heat sinks that have higher aspect ratios and thinner fins than those that can be created by extruded aluminum heatsinks. These folded fin heat sinks can then be soldered to an aluminum or copper base or used in conjunction with heat pipes which transport the heat to the folded fin heat sink that needs to be radiated away. Folded fin heat sinks are often used in combination with a fan or other sort of process that provides airflow to the heat sink area. Because Folded fin heat sinks allow thinner fins than an extruded heat sink, they are typically lighter than them and while still increasing the surface area to manage the generated heat. As a result, folded fin heat sinks are commonly used for consumer electronics components, components for automobiles and aviation, and anytime where the weight of a product is a concern. Bonded fin heatsinks are typically used for forced convection cooling, where they can dissipate more heat than conventional extruded heatsinks by expanding the cooling area by using different fin density and heights. These do this by using stamped or pre-fabricated fins bonded to a heatsink base plate using thermally conductive epoxy or, in some cases, using friction stir welding to improve thermal efficiency. As a result, bonded fin heat sinks are used for large applications/areas that doesn’t require high performance. Some examples of the types of these applications would include electric welding applications and DC-DC converters such as buck converters, boost converters or buck boost converters. These converters convert energy from load to energy storage using elements such as inductors or capacitors. As a result, DC to DC convertors are components used in many applications such as battery power systems, DC motor drives, power amplifiers, adaptive controls, and heaters just to name a few. Getec Industries is the leader in heat sink design for thermal management solutions. Whether you are looking for extruded aluminum heatsinks, custom heat pipe bending or bonded or folded fin heat sinks, we’ve got you covered. Give us a call at 888-000-8499, contact us online, call us at send us an email at sales@getecna.com to speak to a heat sink design expert today.